It's here! It's here! It's heeeeeeeeeeeeeere! 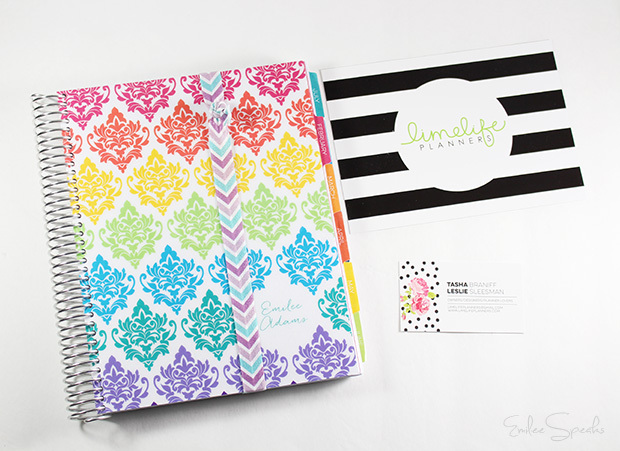 I reached out to Limelife Planners and inquired about their product. They were kind enough to gift me a planner for review. As you know, I've been unhappy with my SugarPaper planner lately. It's a wonderful planner, I just really dislike the layout. It was hard to efficiently plan the 3 main aspects of my life into it. 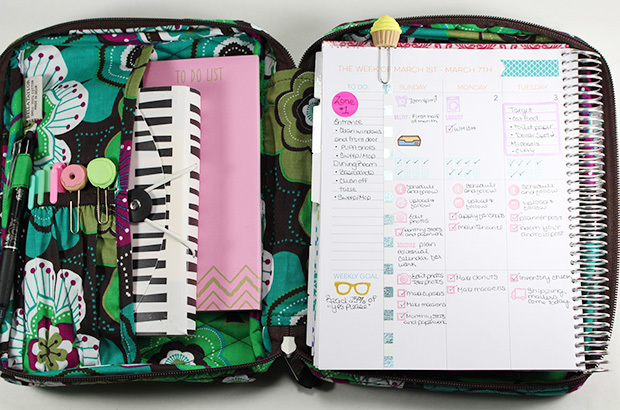 That planner would be awesome for a student or someone just needing to keep day to day life/family events in. Not someone tracking life/family && 2 businesses. Let me be real with you for a moment. I'm a long time planner addict. Even back in my high school days with my filofax in my backpack. I continued on with filofax into my twenties. As the planner decorating "craze" became so popular and the possibilities endless, I had to put away my filofax. Those 6 rings became the end of me. I was constantly changing things, trying new pages, adding in new dividers && folders... it was a mess. I spent more time decorating than planning and being productive. I then moved on to bullet journaling. For awhile this system worked really well for me. I did this for a few years and grew tired of it. There wasn't really one specific thing that I didn't like about bullet journaling, it just wasn't for me. I missed having a traditional month on 2 pages, and something a little more visually stimulating. In came the Moleskine Turntable. Ahhh I LOVED this planner you guys. She was perfect in nearly every way. I even got back into decorating using her [you can see her in past planner posts]. That little Moleskine made me so happy. She was bright magenta with beautiful smooth pages. I told myself I was going to use ONLY her for a year. I lasted quite awhile. The problem with her is that she wasn't big enough. As my blog grew, my planner needs grew. 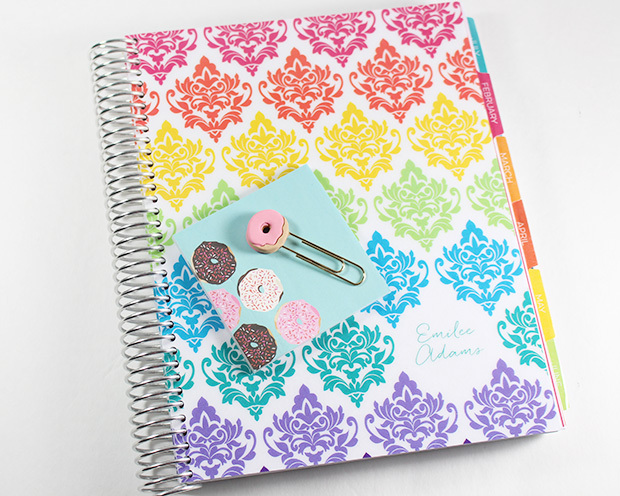 I knew everyone was obsessed with the Erin Condren, but I wasn't impressed. Here's my issue with it... I didn't need my days blocked into morning, afternoon, and night. I saw people washi over those because they didn't use it that way either. I didn't want to have to washi over anything EVERY SINGLE WEEK. I was intrigued by the EC planner, but I knew it wasn't for me. This is when I moved into the Sugar Paper planner. I loved that planner I really did, but it's not right for me either. Now for the Limelife Planner. I haven't even used this planner a full week yet and I can tell you it's perfect for me. I know... I know... it's waaay early to be claiming "planner peace" but I honest to goodness think I have found it. It just clicks. Everything works smoothly && perfectly in this planner. There was no stress of where to put things and how I was going to organize things on my pages. It effortlessly happened. Serendipity. 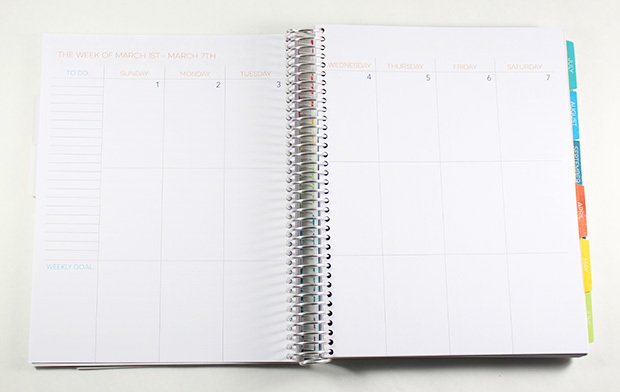 This is what the planner looks like when you first turn the cover page. 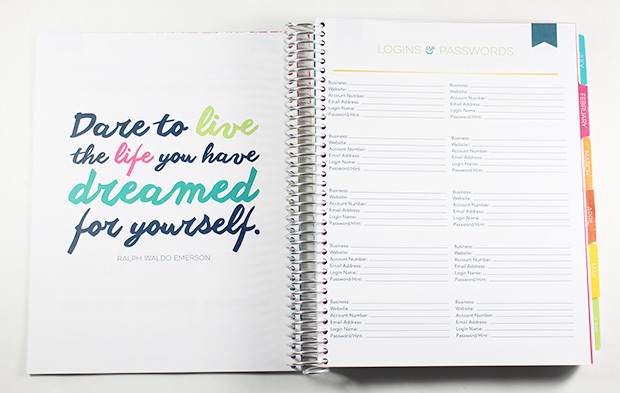 Your cover design is also on several different pages throughout the planner [you'll see more of that in a minute]. This is my cover design choice. They have tons of beautiful covers to choose from. In fact, they just added a couple that I'm really jealous about && wish was available when I requested my design [liiike this one]... Also, don't you just love the quote on the first page? Turn the page: There's a full sheet of Special Dates [holidays etc] for 2015 & 2016. Then the right side has 2015 broken down all at once. Full year on a page. It is followed by 2016 & 2017 year on full pages. Turn the page: There's a beautiful quote on one page, and that is followed by 2 full page sheets for website login info. Turn the page: Following the 2 pages of website login info is 2 pages of goal sheets. Write down your goals && date. Along the top it reminds you to make S.M.A.R.T. goals. I love this. Everyone needs that reminder. Then you have a section of months broken down into quarters. Three months per page. I'm loving on this so much you don't even know. I will be utilizing this section for quarterly tax documentation && stats for my businesses. I'd imagine most people would probably use this section to write down birthdays && anniversaries. 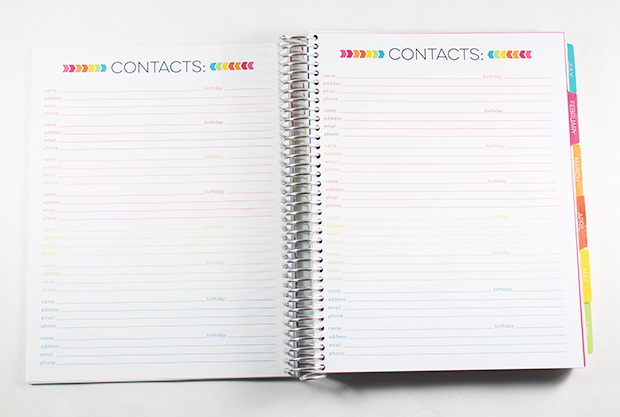 Turn the page: Following the quarterly section is the contacts section. I will be using this section primarily for business contacts. Vendors, advertisers, etc. 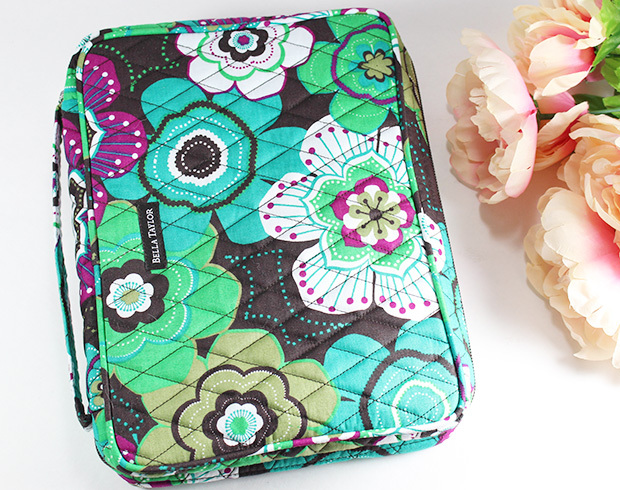 It'll be nice to have all that data in my planner instead of having to pull out my specific blogging binder. I'm going to love having everything I need in one place! 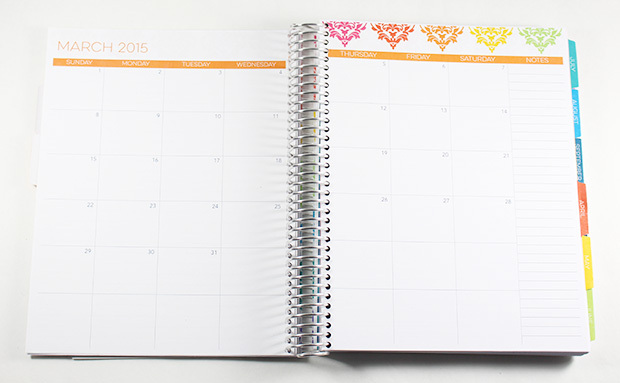 Turn the page: The month on 2 pages coordinates with your cover. Isn't it beautiful? Not much to say here. Standard awesome month on 2 pages with a column for notes on the side. 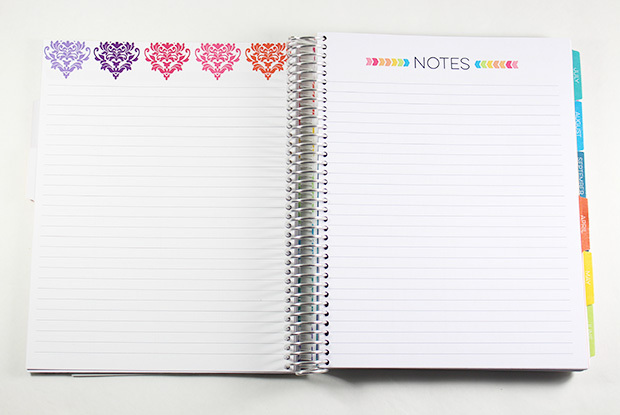 Turn the page: Speaking of "notes"... this planner has notes all through it. There's 2 pages for notes between the month on 2 pages and the start of the week on 2 pages, and then at the end of the month as well. I already know I'll be using the heck out of these. I spend 90% of my day thinking about my blog && my etsy shop. How I can make things better, ideas for new content, etc. I never know where I'll be or when I will have an idea. This will be great because I won't have to remember to transfer it from my notes app on my phone, or the little receipt paper I jotted my idea on aha. Turn the page: Here's what I really want you to see... The weekly pages I chose have the 3 columns similar to Erin Condren, but without the labeling. Now I'm free to do what I choose with these 3 boxes per day. 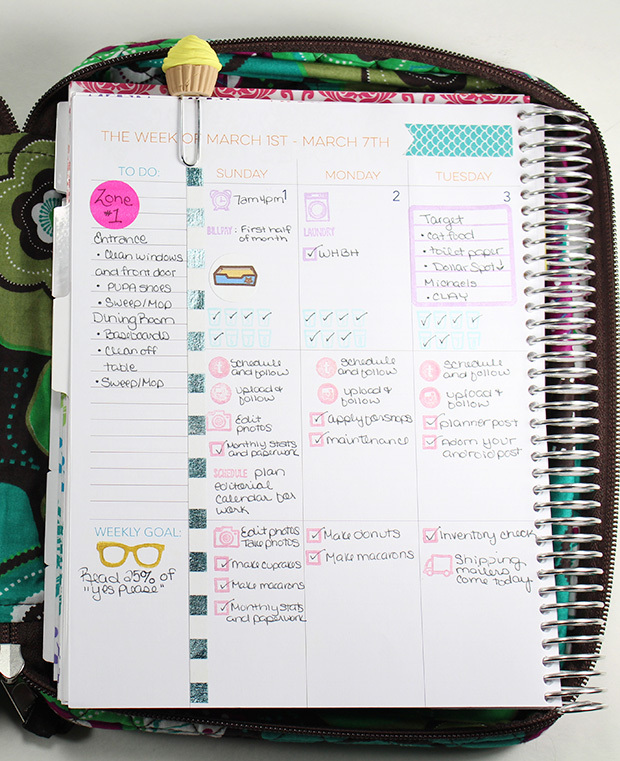 NOTE- the ladies at LimeLife Planners offer several different layout options for your weekly spread. I chose the standard 3 boxes in a day layout. Here's where the "planner peace" fell into place. I immediately knew when I sat down with my new planner how this was going to work. The first box of the day will be for family/household things. The second box of the day is for my blog. The final box of the day is for my etsy shop. This way I know without struggle, exactly what needs done in each aspect of my life. I don't have to cover up any pre-printed morning, afternoon, night with washi because it's not there. On the left side of the page is a column for Notes or a To Do list. 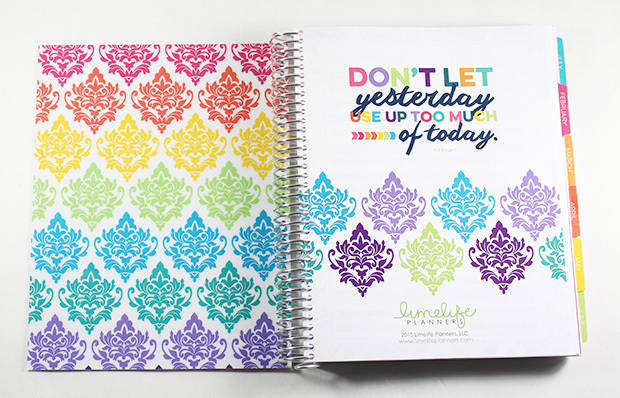 The ladies at LimeLife Planners have been working away adding new things to their line. 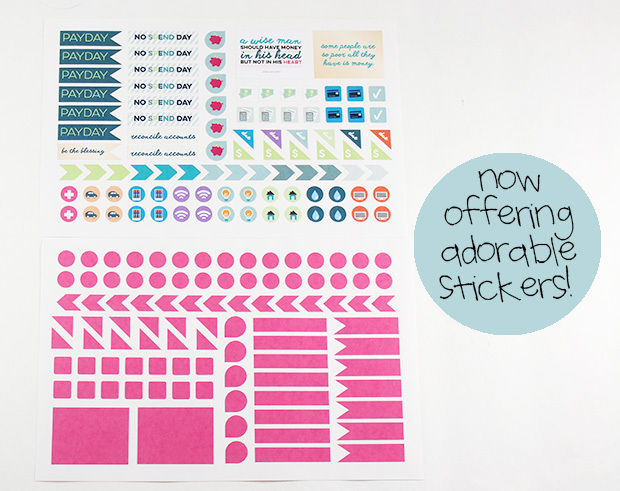 Including planner stickers. They have several options available. These are the ones they threw in with my planner for me. I love them! Including the little quote stickers. My favorite is "some people are so poor all they have is money". Since I plan on taking this planner along with me every where [I have a large purse...] I felt like I needed something to put it in so it stays perfect. I was concerned about my tabs getting bent if just tossed into my purse. Luckily the wonderful Facebook group "We Love Limelife Planners" gave me a great idea. Use a Bible cover. I ran to the bookstore and purchased a Bible cover! It fits like a glove. I don't actually put the cover & back into the sleeves like you would a Bible. This case isn't something I permanently leave on, it's just a carrying case while on the go. Here's an example of how I have it setup on the inside. I keep a to do list pad, a Target accordion file for my most used stickers, pens, && paper clips [of course!]. I'm loving this setup so much. I haven't felt this close to planner peace, ever. I'm excited you guys! Can't wait to share my planned pages with you! Here's a sneak peek into my week so far. Unfortunately you can't see my stamp ink too easily. I used Versa Magic Chalk in the pastel colors, which are pretty light. I also recently purchased several stamp sets from Sweet Stamp Shop. I'm in love with them. They arrived quickly & are affordable. 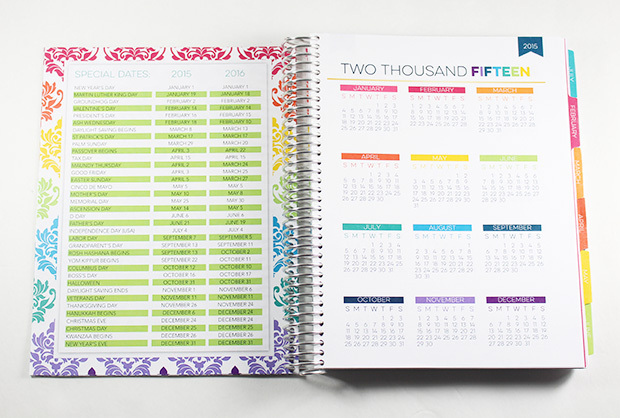 Have you found planner peace? What planner do you use? I wish that someone, somewhere, would actually include the dimensions of the planners. I loved the fact that you found a new use for a bible cover and looked up the brand, which suggests that the planner is smaller than 10x7 to fit into it - and that seems pretty small to me. Help! Hello! You're right, I definitely should have included the dimensions! I apologize! I'll add those in. The pages are 7x9 but the coil adds about another inch making it just about 7x10. It fits perfectly in my bible cover. These are very thick planners since they have lots of "notes" pages in them as well. The planner is about an inch thick. I use my planner for personal use, my blog & youtube, and etsy planning. I find that it's plenty big to hold everything I need. 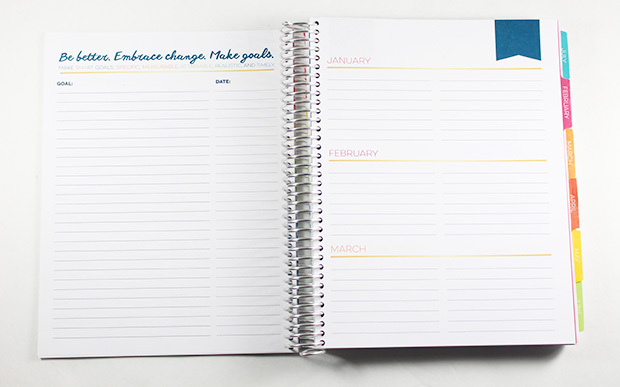 If you're unsure, Limelife Planners offers a free download of a page to test it out and see what you think. They also have several different layout options to choose from. I'm quite positive you'd find exactly what you need. It's a great product and the ladies that own & make them are fantastic. Wonderful customer service. I hope that helps! Thank you for stopping by! The Bible cover is a GREAT idea! I always carry extras around with me to use with my planner, and struggle to keep it all together. I'm definitely going to have to check the dimensions and see if I can get this idea to work for me as well! Thanks for sharing! Where did you get those stamps from ? Do your happen to have the measurements for the layout "A"? I want to try decorating my pages and any help would be appreciated. If you hop on over to the Limelife website, they have printable test pages where you can play with the layout and see what you like. I don't have the dimensions of the boxes off the top of my head but the website should have that info. Thanks for stopping by!